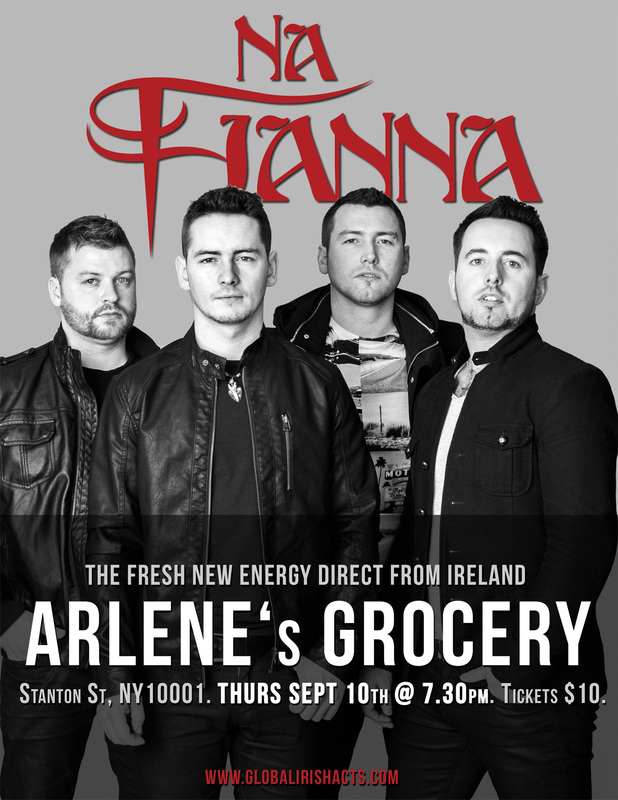 Just two weeks ago Daly Communications’s friend, Na Fianna, performed to a SOLD OUT house at Arlene’s Grocery here in NYC. After debuting their new album, “Na Fianna”, in their home base of Dublin, Ireland, they crossed to this side of the pond as the first act to be launched in the US by the company Global Irish Acts. Their show at Arlene’s Grocery on 9/10 was a true success for the band and was sponsored by both Daly Communications & Global Irish Acts. It is a great pleasure that we have the opportunity to work with Na Fianna & Global Irish Acts who specialize in tour promotion and management exclusively for Irish bands working internationally. This new partnership between the two companies will allow GIA to “build our brand here” in the US according to their head honcho, Dusty Rhodes and “to expand our reach directly into the Irish Music scene and to introduce new acts to Irish America & beyond”, according to President of Daly Communications, Anita Daly. Na Fianna, who first captured a great audience of one million viewers on the All Ireland Talent Show, is now known for keeping their traditional Irish roots while adding a new flair to their sound. They have pleased many audiences around Europe with their rich heritage, energy and passionate performances. Continue to find out more news on Na Fianna’s upcoming US tour in March 2016 through the Daly Comm website & social media pages! Check out photos from their show just weeks ago at Arlene’s Grocery in NYC here!